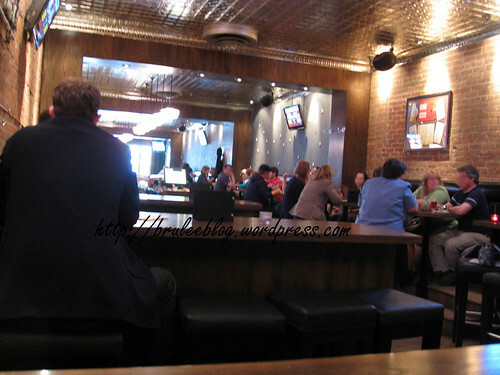 I had some appointments after work one day and decided to stop for dinner at The Hat Resto Pub in between appointments. I’ve been meaning to visit since they opened in October 2008, but there never seemed to be a right moment to pop in there until now. The Hat is in the location of the original Silk Hat restaurant – an old greasy spoon diner that used to be the oldest restaurant in Edmonton and was open from 1912 until it closed in June 2007. Instead of the Silk Hat’s salisbury steak and liver and onions, however, the new Hat specializes in gourmet burgers. Interior - with blurry faces! The inside is very different from the old restaurant, yet at the same time it reminds you of the old place. 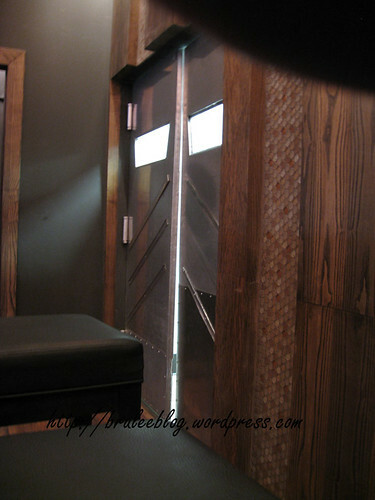 The layout of the restaurant is similar to the old layout – the bar is in the same place, and the floor is the same, except refinished. It looks like they kept the old kitchen door too, which fits nicely with the brand new decor. 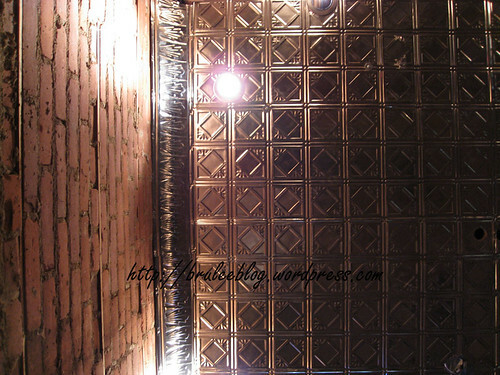 I liked how they meshed the old with the new. It’s got a great trendy-yet-casual atmosphere that makes it a fantastic place for young professionals or hip adults to gather. I do think this is marred somewhat by the many televisions scattered through the entire restaurant; I know, it’s supposed to also be a pub but I think it’s a bit too fancy to be a place where you want to sit for long periods of time and watch a sports game. I could easily see the place marketed as a gastropub, however. There are quite a few burger choices on the menu including chicken and vegetarian choices, and they’re also selling Nathan’s Famous hot dogs. All their beef burgers are 8 oz of AAA Alberta beef, and 4 oz versions are also available. All burgers are served on a Kaiser bun and with a garlic basil mayo, and with an house salad or shoestring fries on the side. I felt like something with a bit of bite, so I opted for an 8 oz with blue cheese, avocado and onion strings. And I couldn’t resist trying the sweet potato fries with Dijon mayo, despite an extra charge for the upgrade. I had mixed feelings about this whole dish. The sweet potato fries were perfectly cooked, but didn’t taste very sweet at all. The Dijon mayo had only a slight flavour. Underneath my fries was a surprise pile of coleslaw. I probably should be more upset that I didn’t get as many fries as I was led to expect when the plate was placed in front of me, but I really appreciated the vegetables. The coleslaw had a light, peppery and tangy dressing that was not overwhelming but had a nice crunch and cut some of the grease from the burger and fries. The burger itself was so big that I had problems biting into it. The top of the bun kept sliding off and eventually started breaking apart in the middle. I eventually gave up and used a fork and knife to eat the burger. The blue cheese tasted great with the meat, but the cheese hadn’t melted at all and kept falling off. 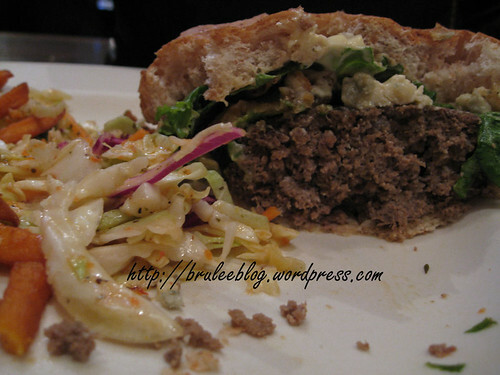 There wasn’t enough garlic basil mayo to affect the taste of the burger or make it more moist. 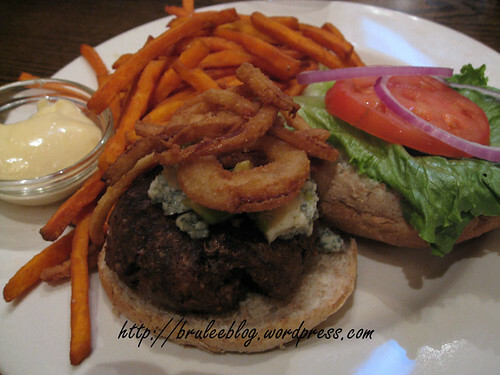 In fact, the meat itself was quite dry and I ended up adding the majority of my fries’ Dijon mayo to the burger. I think the height problem was mostly caused by the meat; instead of flattening out the 8 oz of beef, they let it pile in the middle of the patty. The 8 oz is a lot of food and I think most people would be happy with a 4 oz burger. Would I come back and eat their food? Probably, but not often and likely only if it was someone else’s suggestion. Would I spend full price on their burgers? Doubtful. The Hat offers $3 off of their burgers on Tuesdays, so if you’re interested in their burgers I would visit on that day for the best bang for your buck. Oh, and if you’re a solo diner and don’t sit at the bar or at the counter in the front window, make sure to tell your server that you’re alone. The servers assumed I was waiting for someone and never came back to check on me after giving me my drink order. I’m surprised they didn’t ask me how many were in my group because they only gave me one menu in the first place. And what if I had been waiting for someone but wanted to order an appetizer while I waited? The servers also had this habit of being very focused on their task, so that they didn’t look anywhere else except where they were going (i.e. to the kitchen, to a specific table, to the bar). I had to flag them down more than once by calling for their attention because a raised and waving hand wasn’t noticed at all. The Hat wasn’t too bad when it first opened… we used to live downtown and loved that they were open so late and had fairly decent food. But we’ve been back a couple times in the last few months and while the food quality has still been so-so, even though they raised prices, the service has been really bad (as you alluded to). Last time our order got screwed up – the server took our veggie nachos to another table and brought chicken to us. We let him know and he acted like it was our fault but ordered us a new plate. He didn’t let the other table know they didn’t have their correct order, and then avoided us for the rest of our stay and charged us full price for everything. We are definitely avoiding the The Hat after that. Oh my, I’m glad the service I got wasn’t as bad as that! I don’t blame you for wanting to stay away. 8oz burgers…These monsters just seem to get bigger and bigger! I’m glad to hear they offer a smaller burger. Bummer about the service.